This species has two color forms in California. The males of the population in the Delta tend to have the dark areas of the elytra reduced to 4 smokey spots (D. c. dimorphus). The rest of the state has males with the dark areas expanded to cover most of the elytra (D. c. californicus). Females of the two forms are identical and can not be reliably separated except by locality. Even within the Delta population of D. c. dimorphus a great deal of variation exists. USFW has recommended that the subspecies dimorphus be delisted as threatened and endangered. Moved from Elderberry Longhorn Beetles. Not the subspecies californicus, only the subspecies dimorphus was federally listed as threatened. 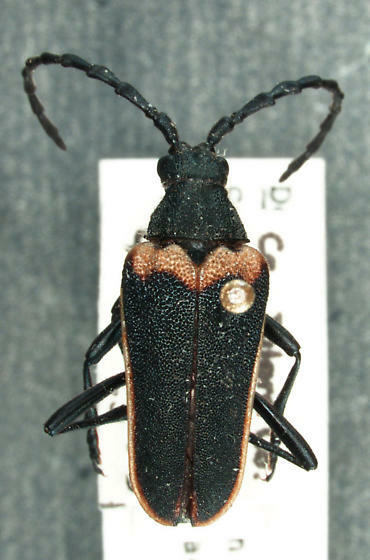 This is Desmocerus californicus californicus the nonthreatened subspecies.